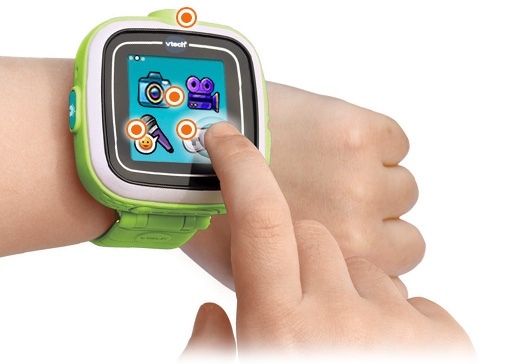 Vtech, the kid-focused tech company behind the popular Innotab learning tablet, today unveiled the Kidizoom, the first ever learning smartwatch designed for kids aged 4 and up. The Kidizoom has a number of cool features that kids will love, including a 1.4” color touchscreen, a camera for photos and video recording, and a microphone with voice-changing effects. The watch comes with 50 different displays and four built-in games, including one that teaches kids how to tell time. Plenty more apps are available on the VTech Learning Lodge app store. Parents, meanwhile, will appreciate that the Kidizoom was designed with a kid's active lifestyle in mind. It isn’t fully waterproof, but the watch is splashproof, sweatproof and sturdy enough to take a few knocks. The $59.99 Kidizoom is currently available in your choice of four colors – blue, pink, white and green. To learn more about the Kidizoom or to order one for your family, visit vtechkids.com. I want an Apple Watch series 4!!!!!!!!!!!!!!!!!!!!!!!!!!!!!!!!!!!!!!!!!!!!!!!!!!!!!!!!!!!!!!!!!!!!!!!!!!!!!!!!!!!!!!!!!!!!!!!!!!!!!!!!!!!!!!!!!!!!!!!!!!!!!!!!!!!!!!!!!!!!!!!!!!!!!!!!!!!!!!!!!!!!!!!!!!!!!!!!!!!!!!! !.